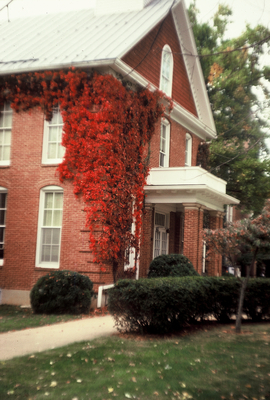 "Virginia Creeper on the east side of Memorial Hall, 1975" by L. Michael Hill Ph.D. Here is a good climbing growth of the Virginia Creeper, Parthenocissus quinquefolia (Vitaceae) on the east side of Memorial Hall, 1975. Eventually it was all cleared away. The roots of the creeper were not good for the brick in that historical building.